JFA Yachts unveils new 164′ explorer yacht project – Superyachts News, Luxury Yachts, Charter & Yachts for Sale. This elegant silhouette with only 3 decks for the 50m of length permits the 164’ JFA superyacht to stay under 500 GRT. This Explorer Vessel offers 4 guests cabins located on at the lower deck and a full beam master cabin forward on the main deck with private access to the fore deck. This large cabin has a bathroom with a bath, a wardrobe and an office. The main deck proposes a large saloon with a dining area directly connected with the aft deck saloon. Another saloon is fitted on the upper deck aft of the wheelhouse. 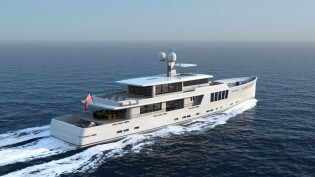 Franck Darnet also proposes to install the master cabin on the upper deck instead of the saloon. This configuration allows for an amazing view and a private aft deck. The interior design will be modern with light oak furniture and panels enrobed in white tissue. The outside area offers a large saloon on the aft deck with stairs to access directly on the fold down swim platform for bathing or tender access. In the aft lower deck, a gymnasium with bathroom will be fitted. The forward deck is fitted with a large locker that receives the main 20’ tender. This large locker could be converted into a pool when the tender is launched. The foredeck will be fitted with another locker to house the crane and another one for a jet ski. A small observation deck has been fitted over the wheelhouse to enjoy panoramic views. Bill Dixon and his team have done a lot of work to ensure the 164’ JFA yacht is an energy efficient yacht with a great deal of autonomy. Aluminum was the chosen build material because of the impact on weight and maintenance. Equipped with 2x 1000Hp engines, this yacht should be able to reach 16.5 Knts top speed and 12.5 Knts cruising speed and to cover a range of over 4800 nm. The yacht will be equipped with zero speed stabilizers, high quality air conditioning system and will be built with very low noise level targets.